“We are in the wrong place. This is not the Kalahari, folks,” exclaims Matt, our pilot, in a droll way as we come in to land. “It's green!” And sure enough it is. I look down at the vast land beneath, coloured emerald by unseasonal rains, with intermittent day-glow orange roads interspersing the landscape like giant snakes. It is the month of January - the height of summer in the Southern Hemisphere - and we find ourselves at Tswalu Lodge in the Kalahari Dessert, owned by the famous Oppenheimer family. 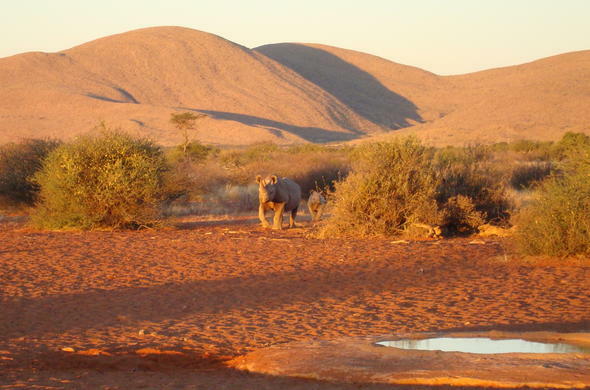 The wider Kalahari is a massive, arid region of sandy, porous land which extends across much of southern Africa. The big sky is swollen with bulging dark grey clouds and the visceral smell of Africa infuses me like a long-lost elixir. 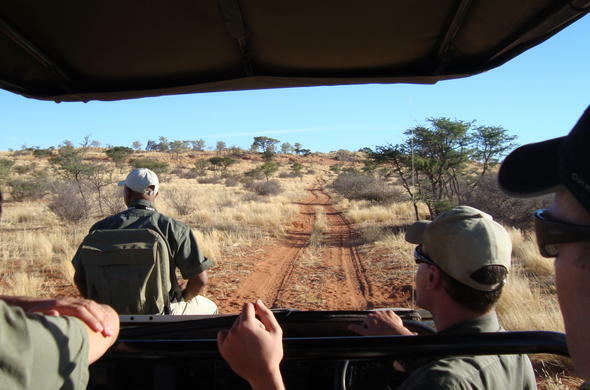 Tswalu is South Africa's largest private game reserve, covering an area of over 100,000 hectares and it is a sensory revelation. It takes us about 20 minutes to get to the lodge and from the moment I step into the opulent yet consciously understated reception area and lounge, I know this is not your common-or-garden game lodge. The décor and ambience resonate all that is Africa in terms of colour, design, tactile fabric and proportion.The lodge has been revamped recently by world-renowned interior designer Boyd Ferguson who made sure it retained its character - the high, thatched roof, the wide verandahs and the open-air feel is all part of the original design. Massive and luxurious leather couches, huge and interesting lamps with hues of soft lighting and the use of natural materials everywhere, make you feel like you are in the most luxurious African hut in the entire world.After a delicious light lunch it's off to our, eh, "rooms" for a siesta. The main property, the Motse, nestles at the foot of the Korannaberg Mountains, facing westwards across the grasslands of the Kalahari. 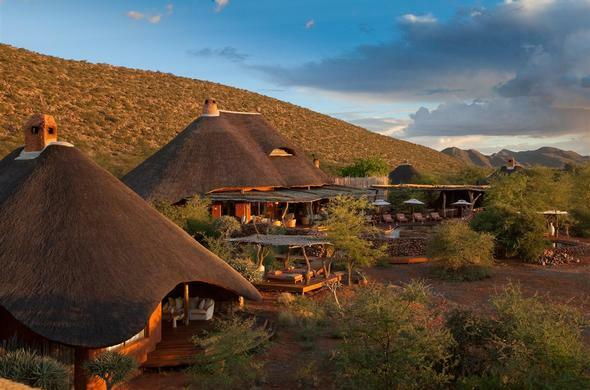 Motse means village in Tswana and the village consists of just eight spacious and secluded "legae" (another Tswana word, for "little house") or suites.These legaes are built of local stone, rich red clay and traditional Kalahari thatch. Each suite comprises a spacious bedroom with an open fire, a humungous en-suite bathroom with both indoor and outdoor shower and a large dressing and study area. My private sun deck overlooks the African plains where a variety of curious antelope walk by meters from me.Two legae have been designed especially for families. Each offers two separate bedroom suites with their own en-suite bathrooms, separated by an expansive living room again leading on to a shady, private terrace. The Motse accommodates no more than 20 guests at any one time. An infinity pool at the main house offers an endless view over the savannahs and a secluded spa is designed to complete your total relaxation. The mezzanine library is equipped with satellite TV (the Motse also has full broadband Wi-Fi access throughout) and its museum cases display rare artifacts from the area. We all meet later for the high tea and an afternoon game drive but I opt instead to luxuriate in the surrounds and explore the immediate area. And anyway, there are rumours of rain...Later, after the game-driving guests had literally trickled in like drowned rats before luxurious baths no doubt, we are seated for dinner by candle light. I am joined by Jolyon De Wilde, a senior game ranger at Tswalu with loads of experience under his belt who regales me with tales of the unique piece of Africa surrounding us. Dinner is superb - steak done to perfection accompanied by good old fashion comfort food broccoli and cauliflower, sweet potatoes and a host of salads.The food here is unpretentious, made from the freshest ingredients and simply mouth-watering. And the service is, well, quite beyond reproach. The staff members are hand-picked, this is clear. They are discreet, genuinely helpful but more importantly, they exude an inner friendliness which cannot be taught.I get to bed early in anticipation of a wake-up call for the game drive at the unholy our of six 'o clock. In the immortal words of Bart Simpson: "Do they have a six 'o clock in the morning nowadays?" It turns out they do and we hit the road early. Jo tells me Tswalu offers sightings of some of southern Africa's rarest and most extraordinary wildlife. 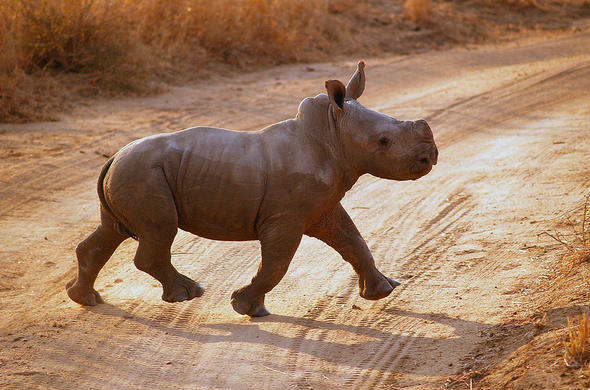 In particular, their population of desert black rhino (Diceros bicornis bicornis) now represents one third of South Africa's remaining population. Kalahari lions are also found here with their unique black manes. Frequent cheetah sightings are possible in the open savannah and meerkats, with their enchanting antics, can be viewed at close range here. Sadly we do not spot these. Well, apart from the meerkats and their oh so gorgeous babies.We spot a lot of antelope though. Tswalu's 90 species of mammals include rare antelope such as roan, sable and tsessebe, the latter of which we see quite a lot. We also spot giraffe and Burchell's zebra wandering across the grasslands. Jo says that in the evening, the Kalahari comes alive with more elusive creatures such as aardvark, aardwolf, bat-eared foxes and brown hyena.One of Jo's specialties is birds - over 230 species of birds have been seen here at Tswalu, he says.After a delicious brunch, made to order, I spend time on the verandah just drinking in the silence and pristine magnificence that surrounds one like the finest silk cloth. The simplest and most natural things here are magically and profoundly transformed - gently drifting off to sleep in the purest linen... inhaling the fragrance of the teak and reeds on your verandah... experiencing the reticent yet raw life-giving aroma the earth and the sky emit just before the rains in Africa... This place is beyond compare.It looked like rain again that evening - which the area desperately needs - so plans to have dinner in the dunes are unfortunately scuppered but it makes me no nevermind since we are in for a splendid night anyway. All the guests are seated at one table and it turns out to be the most fun I've had in a long time. The conversation is animated, lively and filled with laughter. I have a chat to the charming Gus van Dyk, Tswalu's Director of Conservation as well as General Manager.He holds personal responsibility for the care of Tswalu's 100,000 hectares. Gus studied Nature Conservation in Pretoria and then started his career at the University of Pretoria's Mammal Research Institute, where he contributed to new research and understanding of Southern Africa's diverse mammal species.He has an extremely complicated and intricate scientific approach to restoring the Kalahari to its natural state - to do nothing. Well, not quite... "Tswalu was made up of 43 farms originally," he explains. "We got rid of fences, buildings, water holes and kraals. Historically, the Kalahari was badly located for farming so during the short rainy season, farmers would farm for the bad, dry years and erode the earth.Sustained grazing by the herds of cattle and sheep during the dry cycles did most of the damage. 'The environment must get its breath back," he says poetically. "And the amazing thing is that, as the eco-system here restores itself, we are seeing species again in the area that haven't been spotted for many years. "It becomes apparent to me that the Oppenheimers are very serious about conservation. From the beginning, Nicky Oppenheimer's mission has been clear. "To restore the Kalahari to itself. "In 2008, the family created the Tswalu Foundation to develop and fund programmes of original research which will increase understanding and appreciation of this extraordinary part of Africa.Since it began, the Tswalu Foundation has already supported 26 separate, major academic studies. Recent projects include investigating predator and prey relationships, range use and the social dynamics of Kalahari lions at Tswalu to determine the optimal population size. This research is being done by the University of Pretoria. The other interesting work being done is a definitive study of all the spiders of the southern Kalahari and the best conservation strategies for them.Sadly we have to leave the next the next day. Like a child trying to absorb that hollow, melancholy feeling on a Sunday evening in anticipation of boarding school the next day, I wander around this beautiful part of Mother Earth one last time. I etch every detail into my memory. There is a "before Tswalu" and then there is an "after Tswalu." Go there.